This entry was posted in Carnivorous, Chicken Shed, Epiphyllum, Flora, Greenhouse, Grounds on June 14, 2018 by Shelly. 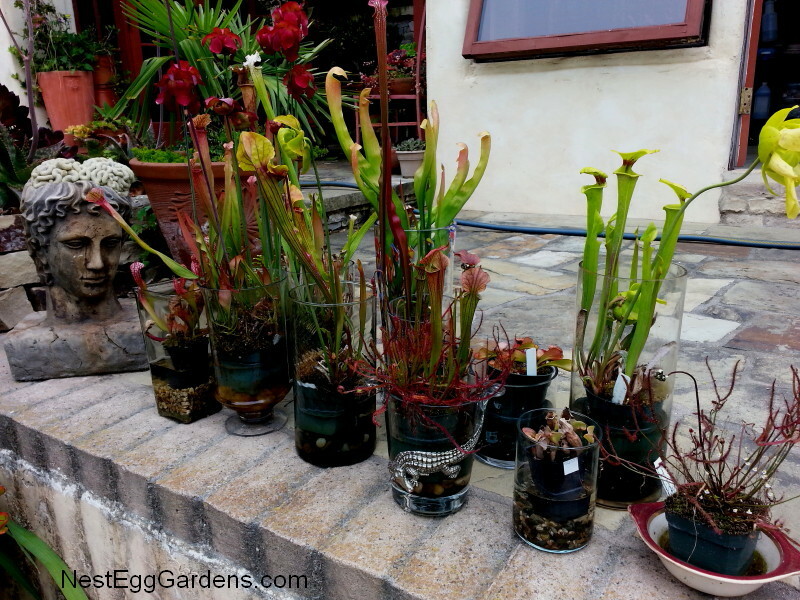 My carnivorous plants are blooming like crazy, and sending up lots of new pitchers too. Soon they will be luring wasps to their death. This entry was posted in Carnivorous, Flora on May 4, 2016 by Shelly. 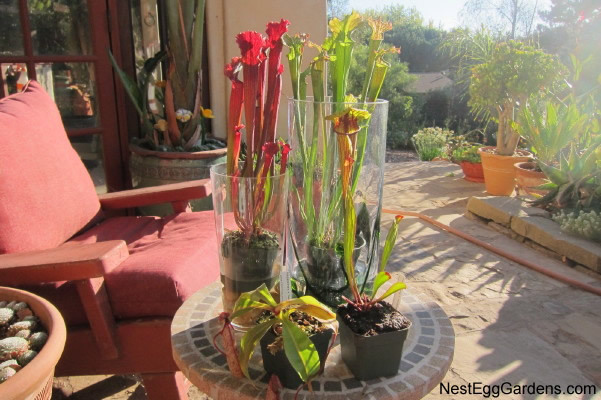 You can tell that summer is almost here by noticing the fabulous color on these Pitcher Plants. When the wasps start coming around, they will be attracted to them. 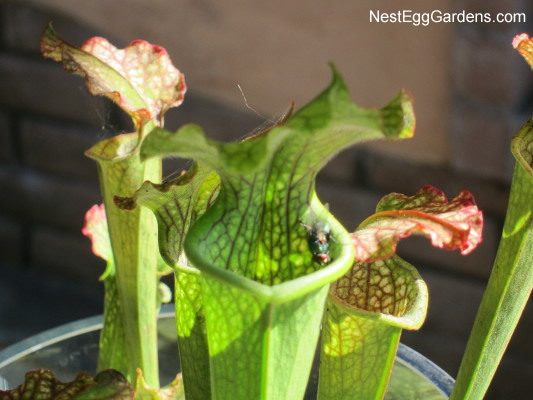 Once they crawl down inside, they aren’t able to climb back out… providing a meal for the plant. 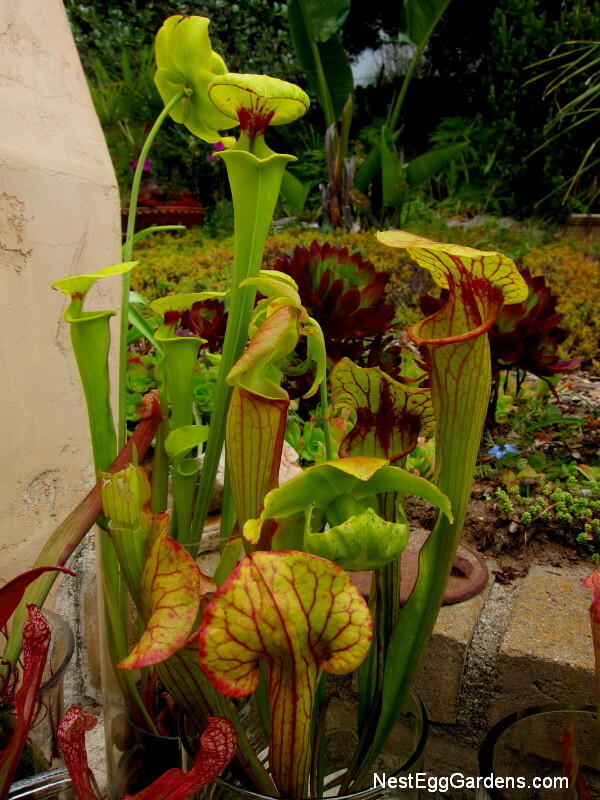 This entry was posted in Carnivorous, Flora on June 5, 2015 by Shelly. 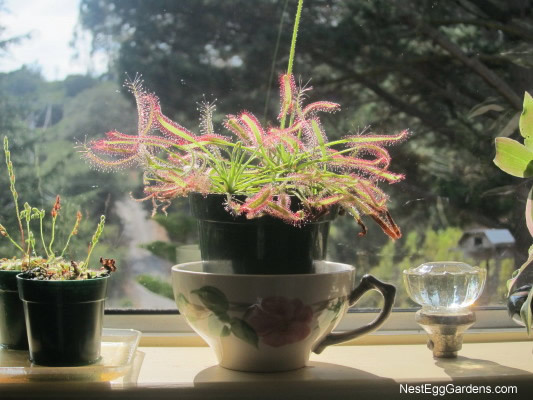 Sundews (Drosera) are innocent looking and pretty, so sparkly in the windowsill. But the gnats, fruit flies, moths and fleas that give it the slightest touch, are doomed to a horrible death. They will struggle for minutes or even hours… held fast by suffocating glue, grasping tentacles, and burning acids and enzymes. The whole time its bodily fluids are slowly sucked away. This entry was posted in Carnivorous, Flora on September 8, 2014 by Shelly. The traps that were full from days ago… are now reopening! Ready for more? This entry was posted in Carnivorous, Crawlers, Flora on November 17, 2013 by Shelly. 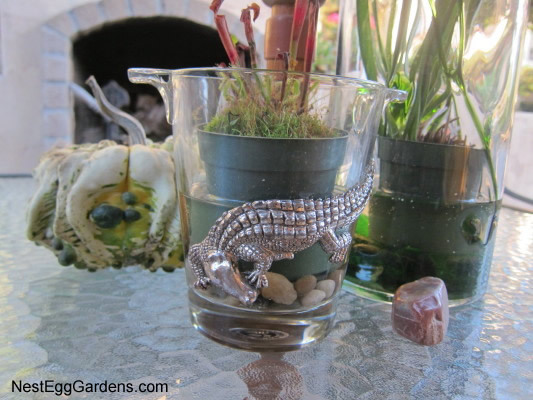 Found the perfect Alligator glass for a small pitcher plant on the patio. Watched a fly, who considered going inside the larger one. Later a wasp swooped over my lunch plate and did go down inside and I could hear him buzzing in there after getting stuck. Carnivorous pitcher plants have hairs that point down along the inside of the tubes that keeps insects from crawling out. This entry was posted in Carnivorous, Flora on October 20, 2013 by Shelly. The carnivorous plant tank in the greenhouse is doing well. 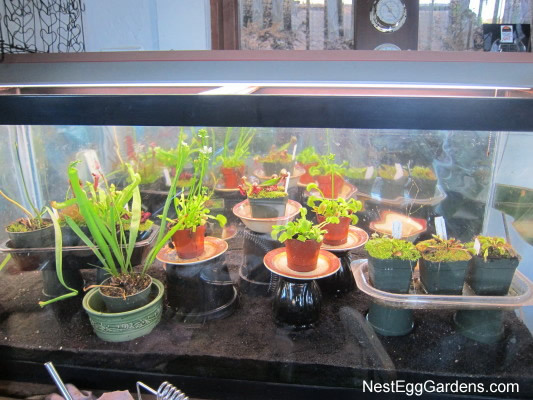 It houses Venus Fly Traps, Sundews, and Pitcher Plants. 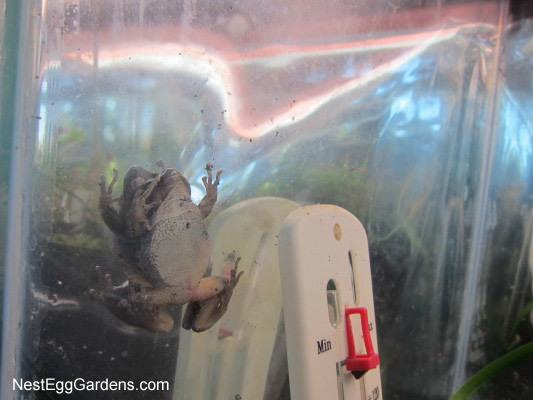 The light is on a timer and surprised a tree frog who found a new hiding place during the night between the glass and the reflective backing. 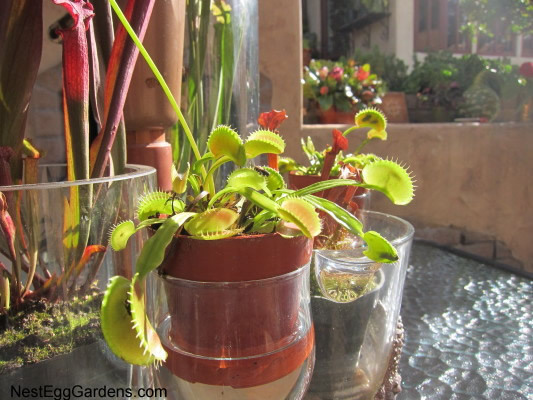 This entry was posted in Carnivorous, Crawlers, Flora, Greenhouse on October 20, 2013 by Shelly. 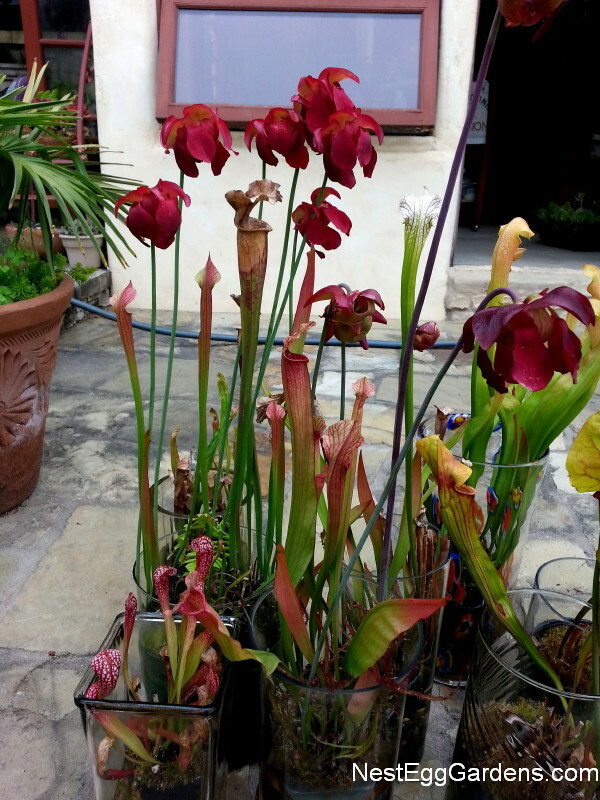 These carnivorous pitcher plants (Sarrancenia) are thriving on the courtyard. The attract flies, but we don’t see any trapped inside. Instead, they are full of dead oak moths. This entry was posted in Carnivorous, Flora on October 13, 2013 by Shelly.